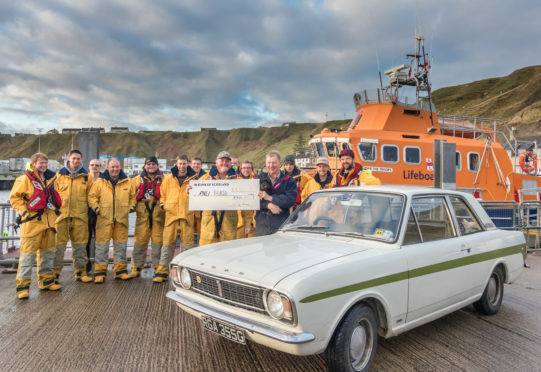 A devoted husband whose wife died last year has completed an NC500 charity run in a 50-year-old car in aid of the RNLI. Rossie Murray, 66, from Thurso, decided he wanted to raise money for the RNLI after he lost his wife Jan last year. She was just 56. The retired Dounreay worker is very grateful for the support his family and especially his son Adam, who is a member of the Thurso lifeboat crew, received from RNLI personnel. He came up with the idea of driving his 1968 Ford Lotus Cortina around the North Coast 500, collecting money en route. Accompanied by his friend Stevie Farquhar they set off on October 26 and drove anticlockwise around the route, collecting donations at each stop. Stevie, who works at Dounreay, also had a collecting bucket at the site for two weeks. They arrived back at Scrabster on October 28 and found they had a grand total of £880. They made it up to £900. The Cortina was virtually completely restored by Rossie a few years ago. Unfortunately it only manages 20 miles to the gallon. This is not the first driving trip Rossie and Stevie have completed. In 2017 they took part in the three-day Monte Carlo Historic Rally and in 2006 drove around the north of Scotland in the three-day Highlands tour. Rossie has several other vehicles he is restoring. He also works on his croft in Strath Halladale and plays in the local band Whisky.